I plugged this glaring gap in my film culture only recently. 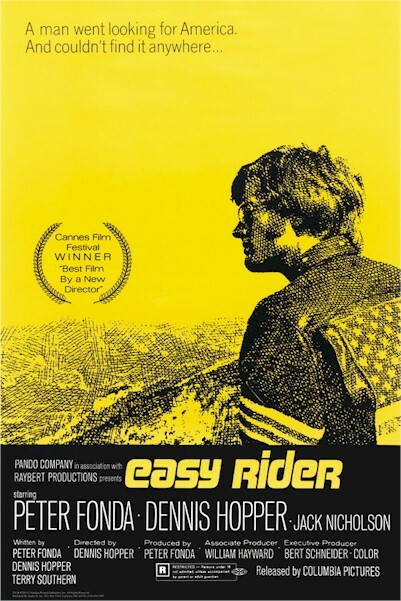 By today’s standards, Easy Rider can easily seem a bit mundane, apart from the LSD-inspired montage near its end. I guess it depends what type of movie buff one is. But there is a reason why it’s considered an eternal film. The coolness of Peter Fonda as Wyatt (a clear reference to Wyatt Earp)… the freedom and lightness of the several pure riding scenes, where nothing much seems to happen apart from Wyatt and Dennis Hopper’s Billy (a clear reference to Billy the Kid) riding their bikes cross-country with cool smiles and to the soundtrack of classic tunes… the three confrontation scenes – with a bunch of hillbillies at a roadside diner, with the same bunch by the fire in a forest, and the final one on a narrow interstate road… the history-recording and culture-commenting scenes such as the hippie commune visit, or the portion of the film where Jack Nicholson takes centre-stage as a a drunk-lawyer who drops his cyclic life to hop on the bike behind Wyatt and ride cheerfully towards the end of everything… and of course, the cemetary/LSD scene that has to go down as a film history all-time highlight… Easy Rider still works today, and will surely work years from now not because it simply yet magically captures a potent period in American history. But because it is a metaphor for every man’s dream – that one day we will drop everything we own, everything that ties us down to society and chokes us, one day we’ll say “screw you” to all laws but our own emotional morals, and ride ecstatically towards the inevitable end, great music blaring in our ears.